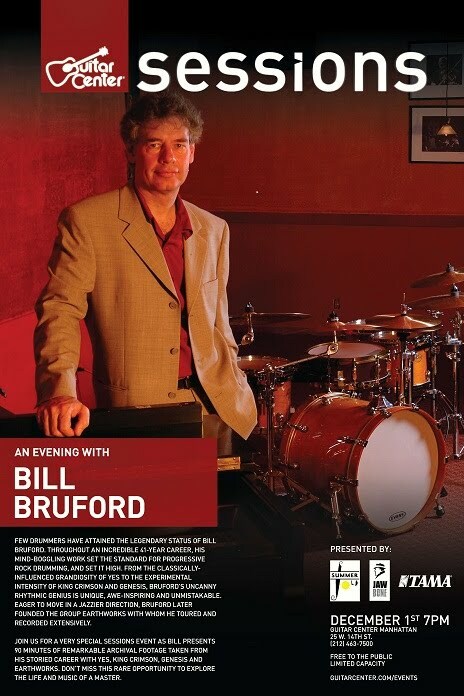 Drum blogs: Bruford Back: Bringing Bill's Big Book? Bruford Back: Bringing Bill's Big Book? Wednesday December 1st: 7.00 pm Guitar Center Manhattan, 25 W. 14th Street, Manhattan, NY 10011. Call 212-463-7500. First come first served. Monday December 6th: UArts, Philadelphia, PA. Private event – students only. Bill will deliver a 90 minute audio-visual talk loosely entitled "The Creative Musician in a Commercial World", based around his recent autobiography. The talk will draw on plenty of archive footage* from Bill’s 41-year career. Books will be available for purchase and signing on December 1st, 7th, and 8th. There will be no hands-on drumming.